Custom Flooring Doctor Phillips, Florida at Ability Wood Flooring. 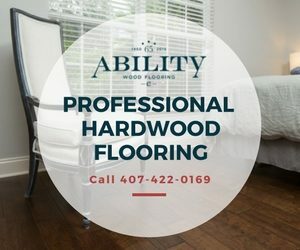 Since 1950, Ability Wood Flooring has been in the business of supplying a wide selection of high-quality floor coverings for home and business owners in Doctor Phillips, Florida, and the surrounding areas. Today, we are proud to be suppliers of well-known brands – and creators, too. Our in-house team of flooring techs, coupled with a state-of-the-art custom flooring machine, mean that any customer can walk in our doors with a vision – and walk out with bespoke flooring in days. We customize all types of surfaces, including engineered hardwood, tile, stone, and more – in any color, pattern, or design you choose. Do you need flooring ideas for your next home renovation project? Stop by our flooring boutique in Orlando – a short drive from Doctor Phillips, Florida. Engineered Wood Flooring or Hardwood Flooring – Pick and choose from an assortment of pre-manufactured flooring. Alternatively, you can ask us to create a unique surface that matches renderings of a new interior design. Note that if you have existing hardwood flooring, we offer sand and finish floor restoration services, with the option to transform the color and design. Tile Custom Flooring Doctor Phillips, Florida – Did you know that you can customize tile floorings to look like wood, stone, and other high-end surfaces? Ask Ability Wood Flooring for pricing, turnaround times, and other details. Kitchen Flooring – Complete your kitchen makeover with one-of-a-kind kitchen flooring. We customize and fit tiles, hardwoods, stone, and more into this space. Bathroom Flooring – Choose luxury bathroom flooring, then personalize the surface to your liking. By now you know: you have options at Ability Wood Flooring. When you order custom flooring, don’t forget to book a pro installation company in Doctor Phillips, Florida. In addition to customizing floor coverings, Ability Wood Flooring is also a highly reputable installation company in Doctor Phillips, Florida. Less Hassles – Save time and money by getting flooring installations done right on the first round. Our professional custom flooring installers in Doctor Phillips, Florida knows the ins and outs of fitting all types of floor coverings. No Surprises – Our flooring installation company in Doctor Phillips, Florida performs all the checks and balances when fitting flooring. Before installing any flooring surface, for example, we ensure the underlayment is smooth and level. Next, we meticulously fit the flooring ordered in the layout requested, so there are no surprises at the end of the day. Ultimately, your satisfaction is guaranteed.